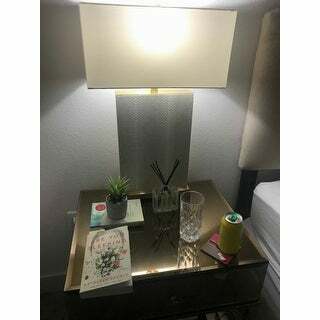 Furnishings appointed to a newly renovated penthouse suite at one of New York City s poshest hotels inspired this modern table lamp. Finished with a m.lange of elegant textures, its suave disposition makes it a designer favorite. These lamps were very easy to assemble and look great in my living room. I am very happy with the look and shape of the lamp shades. I ordered these lamps and wondered if all the reviews could really be true... well they are and then some! These lamps are super glamorous and very high end looking. 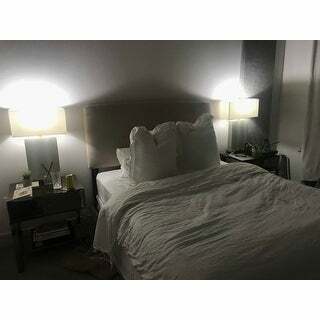 They are very substantial in weight and they make my bedroom look like an expensive hotel for sure! I love them, I got the cream snakeskin pattern and it is neutral and gorgeous! Very handsome lamps. Nicely made and easy to attach shade. I personally love anything with antique brass and these do not disappoint! Very on trend. Shades are white fabric. Base is a combination of white and cream faux alligator leather. Sharp. Large presence but not overwhelming. 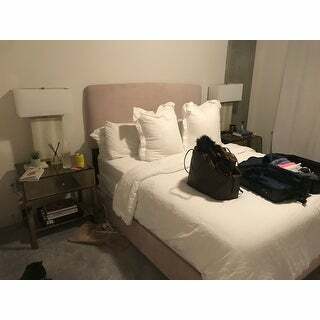 I used fior each side of night tables in my bedroom..stunning. Many compliments! 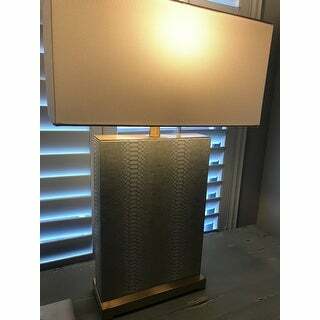 These lamps look so much more expensive than the price. They look exactly like high end hotel lamps. 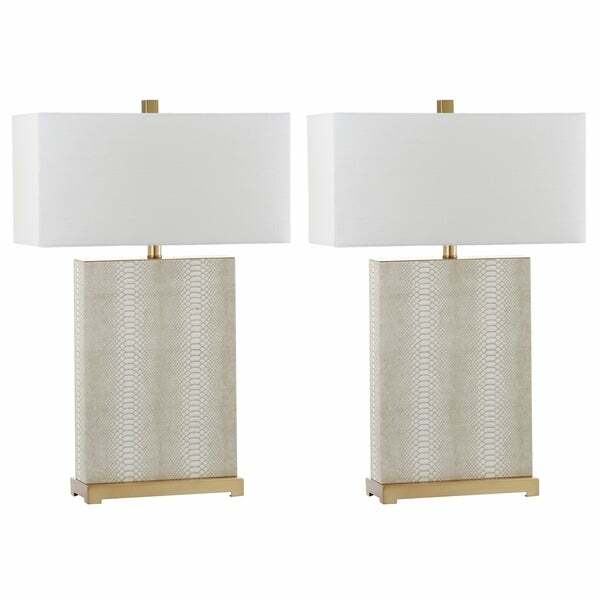 They were the perfect bedside touch to add a modern glamour to my guest bedroom. Though they look very modern, the snake print was exotic and fit in beautifully with a more exotic transitional room as well. Very high quality lamps. They look expensive and are nice and sturdy. The only reason I did not give a 5th star is the cream snakeskin has a greenish tint. Not exactly what I was expecting, but I’m making them work because they’re that nice. These lamps are absolutely gorgeous! They look so expensive and are of the highest quality. I definitely plan on buying more from this brand! The lamps are beautiful! Very narrow which is what I wanted. Four stars because one of the shades was a little dinged up. The perfect finishing touch to my nightstands. Like other reviewers mentioned, they do have a slight green tent. Not a lime green, more of a hunter neutral green. As long as it’s neutral I’m happy. Thrilled with my purchase!!! Love these lamps. Nice sturdy and large. "What are the dimensions of the base and the dimensions with the shade?" "what are the exact dimensions of the lamp (Height X Width X Depth)"
Size/Weight W 18" / D 8" / H 27.75" / 18 lb. "What color is the lamp shade, white or off-white?" 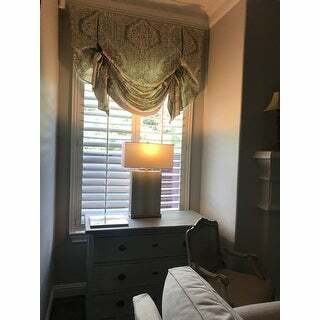 The lampshade is closer to a white tone.